Can a leader be made? A leader is born. And it is a very difficult task to take on the role of a leader. One must be a servant of servants and must accommodate a thousand minds. There must not be a shade of jealousy or selfishness, then you are a leader. In this sutra, lies Swamiji’s philosophy of leadership. Swamiji’s definition of leadership is very different from ours. One, we see leadership as organizing and managing people and resources in order to achieve a common goal. Two, we see leadership as development and building of other human beings. Here, we view the leader as a coach and source of inspiration and guidance to his/ her team. Three, we see leadership as vision and energy. Here, we view the leader as a creator of a new ‘state of affairs’ or new reality who then provides the necessary creative energy and force to not only envision a new world, but also actualize that new world. 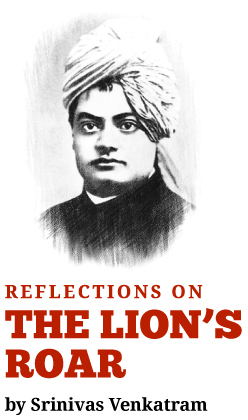 Swamiji’s vision of leadership, includes and transcends these three views of leadership. To Swamiji, a leader is the awakener of the latent power in individuals and collectives. He or she awakens those who ‘follow’ him or her, to become leaders in their own right, to unleash their creative vision, to become sources of inspiration and guidance to others, to achieve great ends and purposes born from themselves. Swamiji’s definition of a leader therefore is an individual with vision, enablement and action, but transcends them to become an ‘awakener’ of other individuals – who can themselves become leaders. Swamiji’s leader is a ‘leader’s leader’. How does one who ‘awakens’ the leadership potential in others act or behave? What are the dimensions on which an ‘Awakening Leader’ manifests himself or herself? The first dimension is, how does one receive the right or mandate, to create a large group of individuals who feel free to act independently and yet feel the need to work together with other leaders around a common goal or single individual? This is possible, if and only if, a leader is a living embodiment of an ideal or purpose. The ‘Awakening Leader’ symbolizes an endstate, as a result of which all other individuals who share the same purpose or seek the same endstate feel naturally inspired, energized, and awakened in the presence of such an individual. Put another way, these leaders have ‘pre-actualized’ their goal within themselves before actualizing the goal in the physical world. Such leaders are ‘born’ of the vision they have pre-actualized, rather than ‘manufactured by a set of techniques or practices’. It is this that gives them the ‘right to lead’. The second dimension of the ‘Awakening Leader’ manifests itself when such a leader becomes a ‘solid foundation’ on which those who ‘follow’ can stand and experience both freedom and growth. The Awakening Leader is not a tree which provides shade to many; rather he or she is the ground or rock which provides stability, reassurance, strength, and confidence so that others may reach their own potential. Such a leader is the ‘servant of servants’. The third dimension of an ‘Awakening Leader’ is his/ her rootedness in the deepest dimensions of human consciousness. The more superficial we are – the more differences we see, the more diversity we see. The deeper we are – the closer we are to the highest truth, the more we see unity and oneness in ideas, opinions, and points of view. The Awakening Leader has thus transcended the diversity of opinions to see and live the deeper unity of truth. Such a leader is easily able to accommodate a thousand minds within the capacious oneness of a higher truth. The fourth, and perhaps, the most important dimension of such a leader is his/ her eradication of all comparison and competition. When does comparison cease to exist? Only when we see our very identity, not as separate and individual, but as collective and universal. Only in such a universal identity is the joy of seeing others succeed, the satisfaction of making others strong, the pleasure of seeing a collective accomplishment unfold.